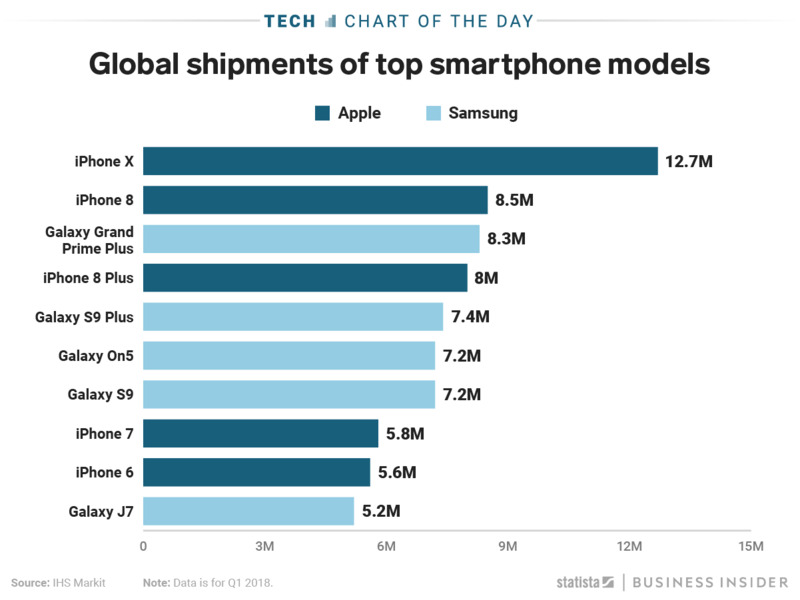 Thanks to the iPhone X and the iPhone 8, recent estimates show that Apple once again holds the top two spots for the most-shipped smartphone models in the world, debunking reports that demand for the iPhone X was lacking. Granted, Apple shipped fewer iPhone X units in the first quarter of 2018 than it did iPhone 7 Plus units at the same time last year, according estimates, but as this chart from Statista shows, the 12.7 million units from this year still put the $US999 iPhone X in first place by a significant margin. And the decrease in shipments of newer models is due to an increase in sales for older models, according to estimates from IHS Markit. 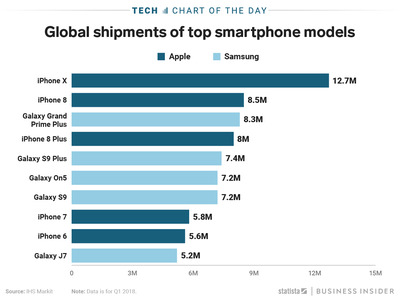 Also obvious is Apple and Samsung’s continued dominance of the entire list of global shipments; each company took five of the top ten spots, with Apple’s top five phones selling 40.6 million units and Samsung’s selling 35.3 million. Chinese manufacturers’ global market share has grown, but still haven’t reached Apple or Samsung levels, partially because of launch delays of devices from big companies like Huawei, Xiaomi, and Vivo.